Last night, I finally got a little time to start on my pretties for Hoot-n-Annie's Great Granny Square Swap. It's been so long since I worked on anything other than amigurumi -- I couldn't believe what a nice break it was to just make squares! 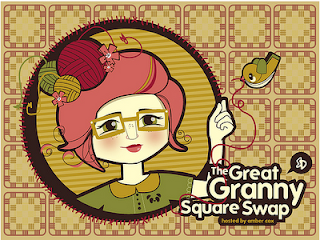 The swap has 21 participants from all over, so the plan is to make a total of 21 granny squares -- one for each of the participants. And while we're working on our squares, Amber (of Hoot-n-Annie) has set up a Flikr group where we can showcase our work! There's just no way I can settle myself down and make one variation of a granny square 21 times, so I've decided to break the project up. I'm going to use different patterns from the web and from my stash of crochet books and make two of each type. I started off last night with a variation on block #3 from Jan Eaton's 200 Crochet Blocks. The block is called "Square Target" and is worked in 8 rounds, but since many of the swap participants are making their blocks a little smaller, I left off the last two rounds. To make the squares, I finally dragged out my absolutely yummy collection of vintage yarns that I've been hoarding for "that special project." Years ago, my best friend's grandmother (an avid crocheter) passed away and left boxes and boxes of unused yarn. 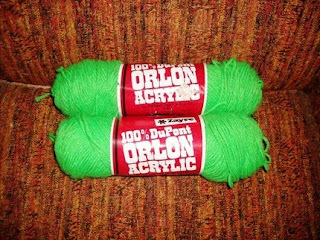 My best friend's parents knew I liked to crochet and showed up at my doorstep with 6 garbage bags full of yarn. I've been using bits and pieces of the yarn here and there over the years. For example, I finished a couple of my friend's granny's work-in-process afghans for her and her mom. And when my best friend had her baby daughter, I used yarn from her granny's stash to make a layette. A lot of the yarns left to me were not enough to make a whole project, yet too very very cool to toss entirely, so viola! granny squares! What's next? Well, that's for me to know and you to find out! Happy Crocheting! P.S. If you're interested in trying out the pattern, I found a very similar version available free online. The Solid Square by Theresa Richardson has a chart, round by round instructions and even a video! :) This swap is gonna be awesome! Your squares are very pretty! You know I'm a beginner, but I'm gonna give this pattern a try! I wish we lived closer and you could sit right next to me and teach me your AMAZING skills! I have to watch and do to learn.